Clear Seal Vinyl Wrap Detailer cleans, protects, and shines clear bras, vinyl wraps, clear lenses, and optical plastics. 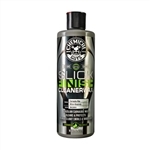 The slick detail spray lifts and lubricates dirt, dust, stuck-on bugs, bird droppings, and fresh water spots from paint protection films and clear bras to reduce the chances of installing any swirls or scratches in the soft surfaces. Nonsense is an all purpose, all surface versatile cleaner that is both colorless and odorless for maximum cleaning power on any surface. Nothing tackles the toughest dirt and stains on any surface like the amazing cleaning power of Nonsense.